In 2019, finding educational apps of high quality seem like a daunting task particularly when you take into account the fact that there are over 500,000 educational apps. Finding good quality education apps that actually enhance teaching and learning can be tricky. We spent several hours researching and testing educational and learning apps recommended by educators, teachers, parents, and kids. Based on our research, we think a good learning app should be provocative, exploratory, and open-ended; it should also have been designed with primary input from educators and curriculum developers, or shown in educational research to be an effective learning tool. The apps we cover in this guide are great learning apps not because they’re designed to make kids smarter, to drill facts, or to replace in-school learning, but because they’re fun and interesting for kids and adults. Check out the best educational apps for teachers and educators that are currently available for iOS and Android devices. Reading Eggs is the multi-award winning learning programme that helps children learn to read. They will learn how to read using interactive reading games, guided reading lessons, fun activities and over 2,000 digital story books. Reading Eggs is a complete learn to read system for children aged 2-13 and covers the five essential components of reading: phonics, phonemic awareness, vocabulary, fluency and comprehension. Parents can see instant results in their dashboard and receive detailed progress reports, which shows exactly where their child is improving and where extra attention is needed. Sentence Master Pro is a fantastic language app aimed at helping young people improve their language abilities. Through focussing on the building of sentences and employing aspects of gamification, the app encourages users to challenge themselves in a game environment to match words together to form a sentence. The way the game works is to give the user a number of words and for them to then unscramble and form into a full sentence within a time limit with the added challenge of losing time when an incorrect answer is chosen. Edmodo is a social learning platform for students, teachers, districts, and schools. Edmodo can be used for communication, polling, assignments/quizzes etc. Managing classes is much easier, and students can easily send teachers individual messages or materials. 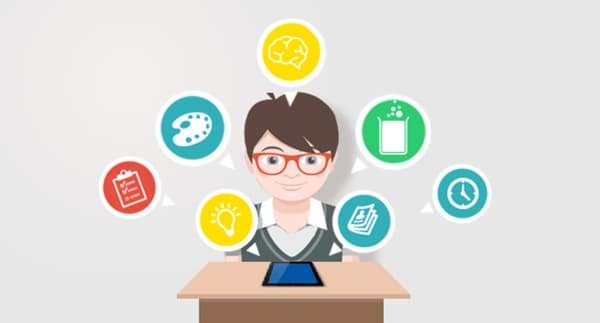 Edmodo is designed to help reduce the workload for a teacher and make it easier to stay connected with your their classroom and their students. Edmodo has millions of resources, created and shared by other fellow teachers, ready to use in the classroom. Millions of teachers have used Edmodo to reach their students, improve learning outcomes, and get more out of their lesson plans. Parent accounts are a great way for parents to observe and stay up to date with their child’s Edmodo activities. They will be able to see their children's assignments, grades, messages from the teacher, school calendar and so on. Kahoot! is a tool used by teachers to administer quizzes, discussions or surveys. It is a game based classroom response system played by the whole class in real time. Multiple-choice questions are projected on the screen. Students answer the questions with their smartphone, tablet or computer. BrainPOP® creates cross curricular animated, educational content that captivates students, supports teachers, and adds excitement to lessons. In primary and secondary classrooms, on mobile devices, and at home, BrainPOP’s award winning resources explain the world using animated videos, educational games, interactive quizzes, and online activities. If you haven’t heard of Khan Academy already we encourage you to try this free tool for both students and teachers. You need to know that the app is an extension of the Khan Academy website which is a non-profit, open source educational website with the aim of ‘changing education for the better by providing a free world-class education for anyone anywhere’. Using the app you can watch more than 4,300 video lessons on topics including math, science, economics, and humanities either by streaming them from the site or downloading them for later viewing or when you don’t have an Internet connection. Nearpod offers teachers an easy-to-use tool for creating interactive lesson plans, presentations, assessments, and digital content. Nearpod allows teachers to create digital lesson plans, share it with students during class, and track individual progress. Lessons are comprised of teacher-created slides that can include text, video, images, websites, questions, quizzes, polls, and assignments. Students are able to follow the lesson on their own devices at their own pace or teachers can lead a synchronized session where students can follow the lesson in real-time. Remind is a safe, classroom-friendly communication tool to help teachers send messages, en masse or targeted, to students and parents. Teachers can schedule reminders about meetings, assignment deadlines, send students messages such as daily homeworkd assignments, reminders of upcoming tests, photos of class activities or notes, links to outside resources like articles, videos and more. They can also message individual students, an entire class of students, or multiple classes at the same time. From students and parents, it will help them to stay on top of what is going on at school from class assignments to extracurricular activities. Teachers can discover content for their classes amongst the millions of study sets on Quizlet. Save time by finding study sets created by other teachers that cover exactly what students need. Encourage the students to compete for the top score by playing Quizlet’s study games Match and Gravity in school or at home. With the Quizlet app, you can easily find resources for any subject at any level. Revise for any subject with fun and interactive flashcards, games and diagrams. Quizlet makes it easy to discover and create study materials for languages, history, science and more. Edublogs lets you easily create & manage student & teacher blogs, quickly customize designs and include videos, photos & podcasts – it’s safe, easy and secure so try out an Edublog today! A growing library of over 80 hands-on Science lessons that is great for home and the classroom. These short videos demonstrate inexpensive and easy to recreate experiments that are designed to inspire and excite kids of all ages. Google Drive is a cloud storage service provided at no charge for Google Apps for Education users. Students may store up to 30 Gb of data (documents, videos, graphics, photos, music, etc.) in their account. Using Google Drive, students can simultaneously edit a document needed for a class project and collaborate with each other online while doing so. These tools allow teachers to make a variety of learning materials available to students online. Included with Google Drive are applications that allow to students to create word processing, spreadsheet and presentation documents. All of these are automatically saved to the ‘cloud’ and are available to students anywhere there is Internet access. Google offers a variety of applications - which ones will be available for students to use? Google Docs, Sheets, Slides: A suite of applications for word processing, spreadsheets and presentations. Google Calendar: A calendar that can be used to enter events with the potential to be shared with others. Google GMail: Allows students to send messages to other students and teachers. This application can be managed so only internal communication is allowed or be made open to communicate with others outside of our district. Google Hangout: Allows people to join a session through sharing video and voice. Google Sites: A web page software that allows the user to build a site to display and share information. WolframAlpha is a powerful answer engine which aims to ‘make all systematic knowledge immediately computable and accessible to everyone capable’. The app shouldn’t be mistaken for a search engine even though it looks like one. It is an informational tool that delivers specific answers calculated from the data gathered from all the information related to your questions. Kids can learn anything because it covers a variety of subjects but they need to learn how to ask the right questions. Students can learn just about anything they ever wanted to know about the solar system and about NASA's missions by navigating through the videos, photos, live feeds, and loads of text in NASA App. For kids with a big appetite for learning about the solar system, NASA App provides a wealth of information. However, given the amount of text and information, young users may need more focus than the app provides. With guidance, kids can discover a wealth of information about the solar system with NASA App. Star Chart lets you to see the stars and planets in the skies accurately by pointing their Android device towards the sky. This astronomy app makes it easy for you to learn more about the objects you are viewing by tapping the star or planet. One of the amazing features is Time Shift that allows you to go back and forth in time to see past and future celestial placement patterns. Duolingo is one of the best English language apps today and highly recommended for English beginners. The gamified learning system of the app helps you learn English quickly by spending twenty minutes a day. Duolingo structures your lessons that teach you about seven new words based on a topic and skill points being awarded for completing the lessons. Notability is one of the most versatile apps available for notes taking. You can type or write notes on notebooks and organize them into folders inside the app. However, it also lets you annotate PDFs, which can be great for grading student papers. Notability also records audio and lets you take notes at the same time. So, you could be having a reading conference with a student, or testing their reading fluency with the audio recorder, while taking notes at the same time on your iPad. Explain Everything is one of the easy-to-use and best interactive whiteboard and screencasting app. It can be used to present information to students in a visually engaging way. But an even more exciting part of this app is helping your students learn to create and present with it – individually or on group projects. Popplet is an excellent way for students to create graphic organizers to organize and share what they have learned! It is easy to use, allows the user to incorporate images and text, and can be exported to photos to be shared via a website. Popplet is a simple and innovative way to organize a student’s thinking by mapping their thoughts in a text, drawing, or image features. It is a rare content creation app that is just as at home in a child’s hand as it is a teacher’s. With this app both can create useful and compelling eBooks, magazines, and guides without taking an age to learn how to use the software. This is a great app, if you are looking for something to help you easily & quickly distribute assignments, handouts, links, etc. to students. Students can also submit work to you through Showbie. It has the ability for students and/or teachers to leave voice notes with assignments. Multiple teachers can create classes within Showbie, so that students can see each class that they belong to. Then, they click on the class to see the assignments that the teacher has created for that class. Teachers are able to give due dates/times for assignments, thus not allowing work to be turned in late. Work is timestamped, so that the teacher can see exactly when it was turned in to Showbie. So many good features! And, super easy to learn how to use it! Educreations Interactive Whiteboard is an app designed mainly for teachers to present lessons that can easily be shared with other students, teachers, or parents. Educreations is a unique interactive whiteboard and screencasting tool that's simple, powerful, and fun to use. Annotate, animate, and narrate nearly any type of content as you explain any concept. Puppet Pals HD Directors Pass is an easy to use cartoon creator app that allows you to create your own animations using a variety of themes and characters. Children's imaginations can really run wild when using the app. From creating a pirate battle to retelling a favourite fairytale or story the possibilities are endless. At Hopster entertainment and education go hand in hand. Our content helps develop kids’ literacy, numeracy and encourages their curiosity. Your little one’s learning is at the heart of everything we do. Hopster is full of characters that kids will love. But what sets us apart from the competition is the magical environment we have built up around that content, designed for little ones to explore and discover new things all by themselves. Hopster: Kids TV, Nursery Rhymes, Music, Fun Games creates a safe space for preschoolers to explore video content and play. The app is a media playground for preschool kids. It has a library of TV shows and music videos, available almost exclusively through the subscription service, and a handful of educational games, which require downloading before playing. Whether you're currently in school or just seeking a little self-improvement, a plethora of Android apps are just waiting to enhance your knowledge base, expand your skill sets, improve your memory and more. Here’s a list of Android educational apps that should prove helpful to most students. Khan Academy Kids, targeting two- to five-year-old children is adaptive to children’s development and lets the child navigate through the platform at their own pace. Kids improve skills through a customized series of interactive activities, books, videos, and creative lessons. Khan Academy Kids’ holistic approach engages students in subjects ranging from literacy to math while encouraging creativity and building social-emotional skills. BrainPop is a paid subscription site (with some free content available to anyone, such as games and some videos) that contains animated content, much of which is aligned to state education standards. BrainPop is designed for kids of age four and up. Lessons begin with a brief animated video and include a wide variety of school- and life-related topics. Each video is accompanied by interactive activities and quizzes that reinforce what kids have learned. It's the apps that really set iOS apart from other platforms - there are higher quality apps available on the App Store for the iPad than any other tablet. The iPad in the classroom brings education to life. Here’s a list of iPad educational apps that should prove helpful to parents and teachers. Kids Academy - Talented and Gifted is not just for those children who have been identified as being especially able, although it has content for those children too, its content is suitable to help all children develop their learning. The app has over 5,000+ educational games, videos, and printables developed by experts in early education around math, writing, phonics and reading games. For more games, check our list of the best educational games for iPad to help educate and entertain young kids.